AWS Managed Services is a set of services and tools that automate infrastructure management tasks for Amazon Web Services (AWS) deployments. The service is aimed at large enterprises that want a simplified way to migrate on-premises workloads to the public cloud and then manage those workloads after migration. AWS Managed Services enables an enterprise to automate cloud management tasks including patch management, change management, provisioning, user access management, incident monitoring, and backup and restores. AWS Managed Services provides a dedicated Cloud Service Delivery Manager and Enterprise-level AWS Support coverage. An enterprise follows a series of steps -- known as the AWS Managed Services Jumpstart process -- to use the service. 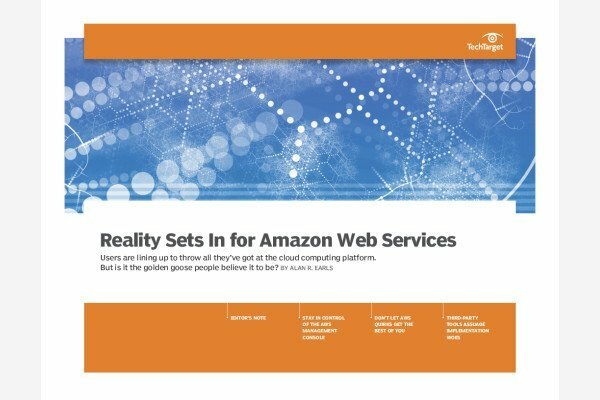 Part of this process includes a planning stage, selecting the applications that will migrate to the public cloud, and then accessing the AWS Managed Services platform. AWS Managed Services assumes control of a customer's AWS account as part of the onboarding process, but an administrator can still make change requests for resources via a self-service cloud management console. AWS Managed Services continuously manages a customer's AWS infrastructure according to best practices set by the Information Technology Infrastructure Library and AWS. AWS Managed Services relies on APIs so it can integrate with other development and systems management tools. The service supports Microsoft Windows Server, Red Hat Enterprise and Amazon Linux operating systems, and can be used to manage over 20 cloud services on AWS. The AWS Managed Services product is different from the AWS Managed Service Provider (MSP) Program. However, an MSP within the AWS Partner Network can complete AWS Managed Services training to add the product to its portfolio. The AWS Managed Service Provider Program includes AWS-vetted MSPs with experience in a range of cloud technologies, including DevOps, security and application migration. An enterprise customer can use AWS Managed Services to manage its AWS infrastructure, and also use an MSP to handle advanced tasks, like hybrid cloud and multicloud deployments or application management. MSPs that have completed training for AWS Managed Services include Accenture, Logicworks and Rackspace. Will you use AWS Managed Services or an integration partner?